I should probably do this more often, but since I don’t, I will only post about the books I can remember reading. And if they weren’t memorable, they probably weren’t worth writing about anyway, right? Some of these were read so long ago that I don’t have a lot to say about them, so I’ll leave you to your own research. The Thornbirds – Not something I would usually pick by its cover, but it was well-written and haunting. The Shoemaker’s Wife – Heart-wrenchingly beautiful tale that follows a pair of kids from the Italian Alps to New York to Minnesota. The Forgotten Garden – I remember enjoying this volume by Kate Morton a couple years ago; she seems to like writing about folks who have little memory of their past and go on expeditions to find out more. The Secret Keeper – Another Kate Morton novel. They’re long, but I do find them captivating. This one is based in the present (2011) and in 1941 bomb-ridden London. Surprise twists. 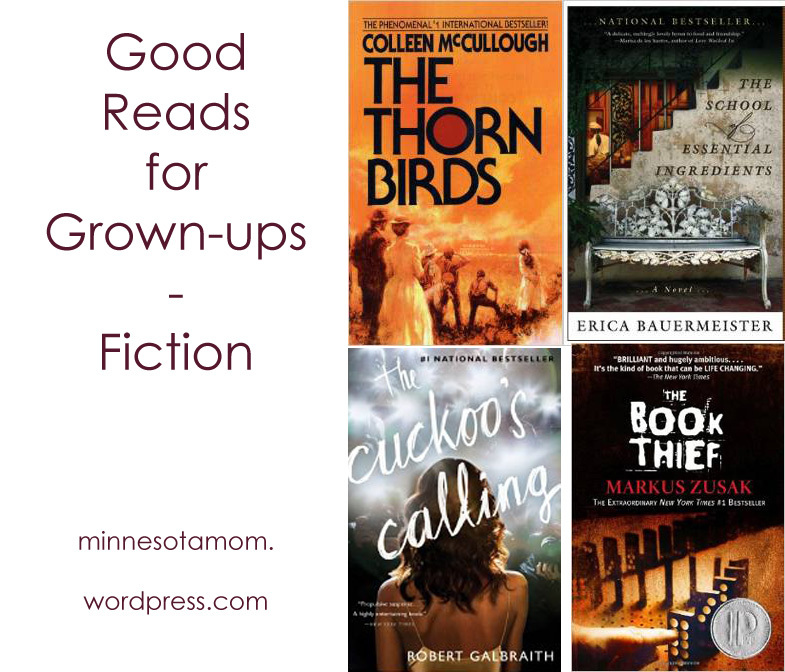 The Cuckoo’s Calling – Written by J.K. Rowling under a pseudonym (Robert Galbraith), this mystery kept me guessing. It’s been a while since I’ve read a true mystery novel, and I found myself enjoying it again! Where’d You Go, Bernadette? – Compelling, well-written. I had consumed quite a bit of summer “fluff​” before I read this and it seemed great by comparison. The School of Essential Ingredients – I want to eat all of Bauermeister’s books, but this one is the most edible. A feast for the senses. A Week in Winter – I really enjoyed the character development in this one. For Chicky to have gotten away with her lie, it’s a bit much to believe, but the story that came after that was delightful. Maeve Binchy is the author. I’ve read a couple of her other novels, and I always enjoy the Irish setting. The Rosie Project – A man who doesn’t know he has Asperger’s attracts an unlikely lady friend. Quirky and charming. The Book Thief – Heartwrenching look at WW II from inside Nazi Germany. Character development is wonderful, the players captivating. DH and I are both primarily Swedish by heritage. We first heard the name Aine (Irish spelling, I believe) watching some pioneer series they aired on PBS. Years later we found that there is a Swedish spelling, and we both fell in love with the name. While Anja is a little more common ‘round these parts than Aine, we still get many mispronunciations, the most common being “Ann-yuh” and “Ahn-juh.” It is, in fact, pronounced “Ahn-yuh,” for the record. The poor dear will be correcting people for most of her life, I’m afraid, but she’ll be correcting them on her last name, anyway, so it’s not like we added too much to her woes. Maybe I should’ve done this with my degree.